After recently deciding to try the FODMAP diet in an attempt to get my IBS under control I realised that I’d need a good recipe for a dairy-free and gluten-free biscuit that wouldn’t hurt my tummy. 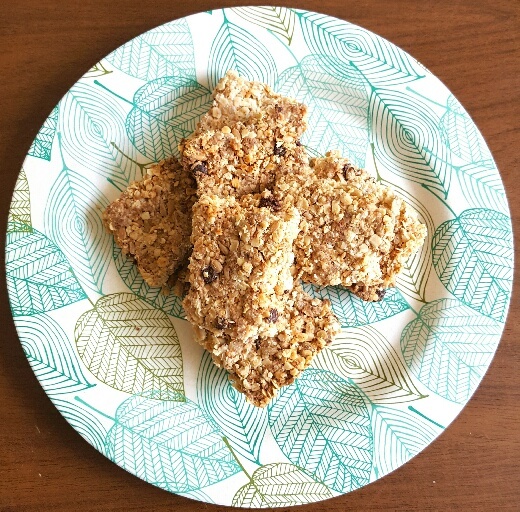 After some investigation I figured that oaty Anzac biscuits were the way to go because they are made of low FODMAP ingredients, but are still very tasty and satisfying. 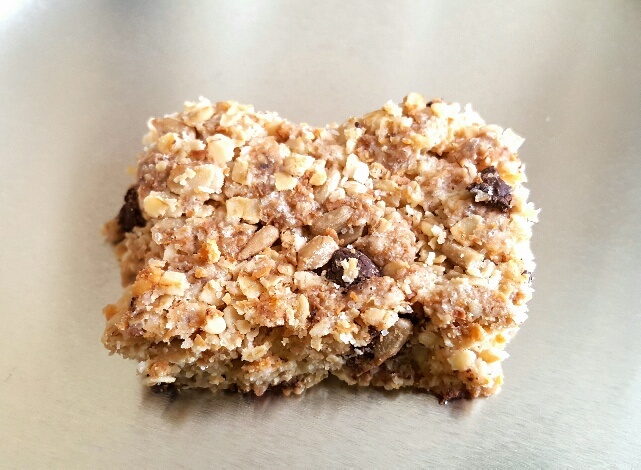 Anzac biscuits are a sweet oat-based biscuit that was originally baked by the wives of men who were in the Australian and New Zealand Army Corps (ANZAC) during World War I. The hard tack biscuit was perfect for sending to men who were fighting abroad because its ingredients did not go off easily and so the biscuits travelled well. However, the biscuits were also enjoyed on the home front, being served at fundraising events such as fetes and galas to raise money for the war effort. When I started making the mixture I wasn’t entirely convinced that the Anzac biscuits would hold together upon baking because the texture of the mixed ingredients was very loose, so I packed my biscuit mix into a baking tin and baked it whole and then cut it into individual pieces while it was still warm. However, once they had went completely cold I realised that they would probably work fine as individual biscuits because once they’d been baked they hardened into crispy little slices that were crumbly, but not overly so, and kept their shape very well. I baked mine with some leftover vegan dark chocolate chips I had in the kitchen cupboard that needed used up and they were delicious in the biscuits, but I think that the next time I make them I’ll add the chocolate chips, but I’ll also decorate them with a drizzling of melted dark chocolate to further enhance the chocolatiness of the Anzac biscuits. Oats, coconut and chocolate go so well together, don’t you think? Although these biscuits are made with gluten-free oats and gluten-free flour , if you’re not gluten sensitive then just use normal oats and flour (they’re considerably cheaper, so lucky you!). 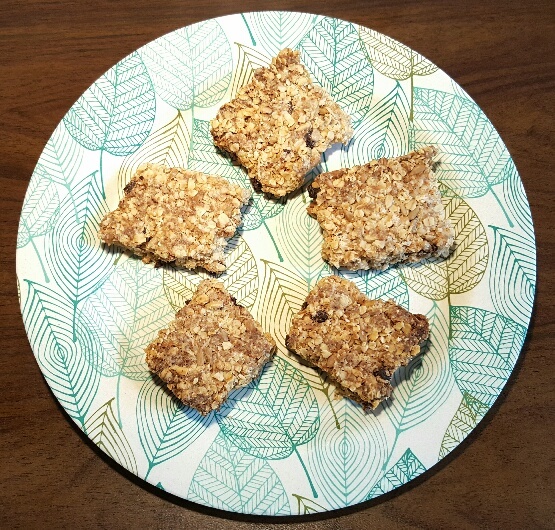 Regardless of whether you make these with or without gluten you’ll be rewarded with a very lovely oat and coconut sweet biscuit that’s crunchy, but crumbly. It’s everything you could possibly want in a biscuit really. Soak 1 tbsp of chia seeds in 3 tbsps of cold water for half an hour. Preheat your oven to 170C/150C Fan/350F/ Gas mark 4. Line a baking tray (if you’re making individual biscuits) or a baking tin (if you’re making one large bake and then cutting it into squares, like I did) with greaseproof paper. Melt the coconut oil and then put all of the ingredients into a large bowl and mix to combine. Form into individual balls (about golf ball size) and then place on the baking tray and press them down slightly so they form a little patty, or if you’re baking it as a whole, tip the mixture into the baking tin and press it down. Bake in the oven for 25-30 minutes until the biscuits are golden brown. Remove from the oven and, in the case of the individual biscuits, leave to cool. If you’ve made one large bake, then leave it in the tin, but cut it into squares while it’s still warm. Wait until the biscuit is totally cold before removing from the baking tin. Watch you serving sizes, too. I wouldn’t eat more than about a quarter of a batch a day, and that might be pushing it (my first few weeks I was ODing on fodmaps because I made cookies and ate them for three snacks, mostly because I couldn’t think of what to eat.